In a repeat of their Indian Wells quarter-final earlier this year, Karolina Pliskova and Daria Kasatkina will resume their head-to-head on the clay courts of Rome. When the pair played in the desert in March, Pliskova produced arguably her best performance of the season so far, hitting a sensational 30 winners to 10 unforced errors – for Indian Wells where the stats are never pretty, this was amazing. Kasatkina didn’t do a lot wrong but against someone with a big serve and huge groundstrokes (Note – Serena at AO too), it did highlight that her game lacks punch and has almost nowhere to go in these situations. It’s hard to gauge Pliskova’s level this year because there has barely been a pair of stable results. She’s looked stunning at times, but worryingly devoid of ideas and energy on other occasions. On the clay, Pliskova reached the quarter-finals of Stuttgart with solid wins over Lucie Safarova and her pigeon, Ana Ivanovic. She started Madrid well with a thumping win over Lourdes Dominguez Lino, but lost out to Christina McHale in the second round. While the American player has had a vastly improved year, it’s still the kind of match you’d expect Pliskova to win with the firepower she possesses. Kasatkina hasn’t won a match on the WTA tour since a tough loss to Sloane Stephens in Charleston where she held a match point in a wonderful quarter-final, eventually losing, 1-6 7-5 5-7. 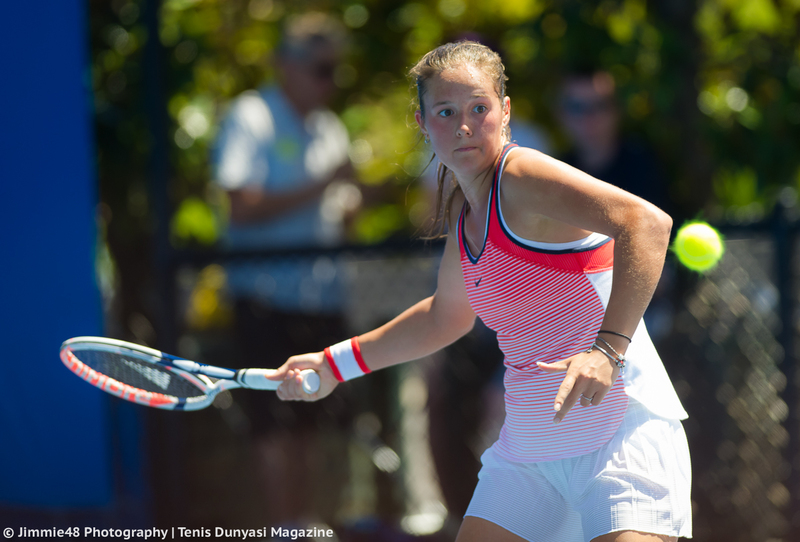 Since then, Kasatkina went 1-1 in Fed Cup (including winning a set off Victoria Azarenka), pulled out of Prague and then lost in the first round of Madrid to Patricia Maria Tig. Kasatkina took a medical time-out in the first set for a right forearm injury and while she carried on, it was clearly bothering her. Tig won in three sets, 6-3 4-6 6-2. Head-to-head record: In their only previous match-up, Pliskova defeated Kasatkina at Indian Wells, 6-3 6-2. Interesting Stat: The loss to Tig was the first time that Kasatkina (excluding a retirement loss to Lara Arruabarrena in Sydney) has lost a match in 2016 to a player ranked below her. At the time it looked like a disappointing loss but after Tig’s run in Spain, it didn’t look so bad! Final thoughts: While Pliskova won their only match comfortably, she played close to the peak of her ability. On clay, there could be be a reversal if Kasatkina can play a smart match. The Russian player will have to hope for a few opportunities on the Pliskova serve… otherwise it’s going to be super tough! If Kasatkina can disrupt Pliskova’s rhythm in rallies by mixing up pace and keep her on the move with decent shot placement, then I like Kasatkina’s chances of winning this match. May 8, 2016 in Ka. Pliskova, Kasatkina, Rome, WTA. I kind of want Kasatkina to pull out the win. I actually think either one of them would cause Azarenka all kinds of problems IF they went into that match feeling confident. I’m looking forward to this match and I’d like to see Daria come through. I think it will be a much closer match than their one in Indian Wells but it’s hard to tell when Pliskova is going to peak. The speed of the court should favor Pliskova but I have this inkling that Daria is hungry for the upset and that she may get it. Not as confident about Kasatkina’s chances against Azarenka, assuming Vika’s injury was more of a precautionary episode. I think that’s looking too far ahead for now, Kasatkina-Pliskova will be an interesting one! The speed of the court will not favour Pliskova. It depends on Pliskova’s serves. The match could be closer than the first meeting but Pliskova usually plays well in her first match. Secondly, she should have enough rest to prepare for this one. Pliskova will win. Thrilled for Daria. I’d love to see her beat Azarenka. I think she has it in her. Yes me too, I managed to watch the second set in my lunch break. I was rather stunned she served it out, did really well but Pliskova was poor. It was a big win after missing MPs against Roberta and Sloane this year. Second round match first!